Visit Buffalo's top restaurants on a Buffalo Pedal Tours party bike. Thes are private tours for up to 14 people. You select the places to dine at from our list of recommended partners. All trips last two hours or more and visit two restaurants. Sip wine and enjoy snacks while to travel to your dining spots. Trips take place on Mondays-Wednesday when restaurants have more time to devote to our unique tours. The prices below include use of the bike, guide and sound system. These tours require more planning than a traditional pub crawl. We are ready to help create the perfect experience. Call us to discuss your plans. Monday - Wednesday.......prices start at $349.99 **plus gratuity, traditionally $6.00 a person. Popular Stops - Tappo Restaurant, Soho and Deep South Taco. Visit Buffalo’s top restuarants on a Buffalo Pedal Tours party bike. Book your progressive dinner party in Buffalo, NY! Everybody loves our bikes, but not everyone wants to stop at three bars to drink. Enjoy our bikes in a more relaxed way on a progressive dinner tour. Downtown Buffalo is home to a delightful array of restaurants and pubs. We offer customized restaurants tours of Buffalo, NY. , Our customer support staff will be there from the minute you call with questions. We don’t set menus or provide food, we recommend restuarant from our list of perferred partners. You contact your restaurants of choice before the tour to discuss the number of diners you’ll be bringing along. We find that advanced notice helps keep you on your touring schedule. While on the bike you enjoy your favorite wine and snacks. You select the music to set the mood. Your bike guide will be there to keep track of the time and assist you with tasks. A Progressive dinner party is a great way to relax with friends or cleints while getting to know our city’s ever-changing food scene. Our customers employ considerable creativity when designing their tours that include themes like: international cuisine, gastropubs, gourmet, meat-lovers’, vegan specialties, and much more. If you’re new to town, our customer support staff will be happy to help you design a Buffalo restaurant tour that showcases our customers’ favorite venues. 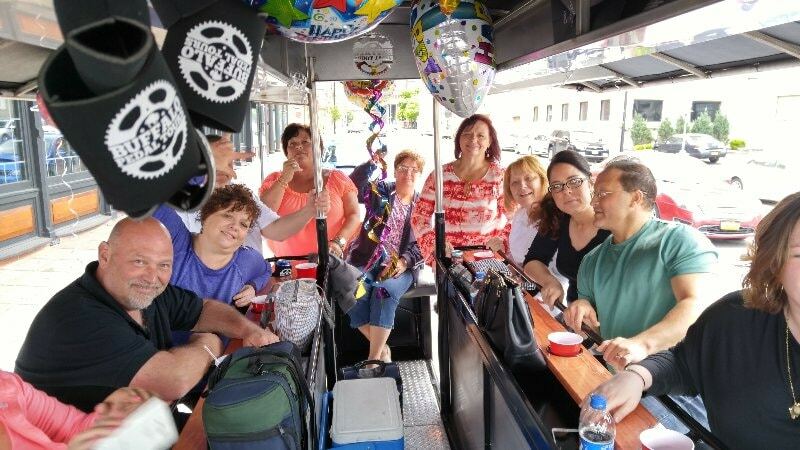 The ultimate choice is yours when it comes to the tour’s design, but we’ll do everything we can to make your progressive dinner or restaurant tour in Buffalo, NY, a success. It’s the perfect way to celebrate a family reunion, anniversary, birthday, graduation, promotion, and more! To set up your Buffalo restaurant tour, use the Book Now option!